scientifically engineered and optimized just for spas! From the combined hot temperatures and high powered propulsion water flow to the intimate bathing environment, the filtration needs of a spa are very specific and fundamentally different in many ways from pool filtration. 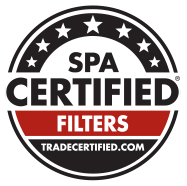 Spa and pool replacement filter cartridges have always been clumped together using the same design and materials for both environments. As the industry leader in science and innovation, Pleatco set out to research, develop and successfully create the world's first and only premium replacement filter cartridges scientifically engineered just for spas! You can replace any type or make of filter cartridge with a superior Pleatco cartridge. for your pool or spa by using any one of these three methods. Diameter 2 3/4 " 2 7/8 " 3 1/16 " 3 1/8 " 3 1/4 " 3 3/8 " 3 7/8 " 4 3/16 " 4 1/4 " 4 3/8 " 4 1/2 " 4 5/8 " 4 3/4 " 4 15/16 " 5 " 5 1/16 " 5 1/8 " 5 3/16 " 5 1/4 " 5 5/16 " 5 3/8 " 5 1/2 " 5 5/8 " 5 11/16 " 5 3/4 " 5 7/8 " 5 15/16 " 6 " 6 1/16 " 6 1/4 " 6 3/8 " 6 1/2 " 6 9/16 " 6 5/8 " 6 3/4 " 6 15/16 " 7 " 7 1/16 " 7 1/8 " 7 1/4 " 7 1/2 " 7 9/16 " 7 3/4 " 7 7/8 " 8 " 8 1/4 " 8 1/2 " 8 11/16 " 8 7/8 " 8 15/16 " 9 3/4 " 10 " 10 1/16 " 10 1/8 " 10 3/4 " 11 "
No other filtration media comes close! PLEATCO ADVANCED SPA 3.2 ounce point bonded filtration fabric is meticulously constructed with a high volume of incredibly fine fiber strands providing better flow, higher dirt holding capacity and longer performance life OPTIMIZED FOR SPAS. Due to the finer fibers and high-tech construction technique, this new fabric has a larger cumulative wet surface area compared to competitive trilobal products. Our new Spa fabric allows the release of greater volumes of dirt allowing spa owners to clean the new filters simply and effectively, resulting in better flow, less maintenance and longer cycle times between cleaning. Pleatco Advanced Filter Cartridges are constructed with precision engineered Free Flow Cores . Our cores allow for the even flow of water through the entire cartridge which increases filtration, uses all the Pleatco Advanced Point Bonded Filtration Fabric, and makes it easier for the pump to move water through the entire cartridge. Pleatco’s Free Flow Cores are designed to be efficient, robust and save energy, money and the environment. Nobody talks about cores. Why? Because all of our competitors use PVC pipe with holes drilled in them. Take a few seconds and look inside any of our competitor s cartridges and then look inside ours... you ll see the difference immediately. It s obvious. Pleatco’s cores allow for the even flow of water through the entire cartridge which increases filtration, uses all the Pleatco Advanced Point Bonded Filtration Fabric, and makes it easier for the pump to move water through the entire cartridge. Pleatco’s Free Flow Cores are designed to be efficient, robust and save energy, money and the environment. Leaders in science & innovation. At Pleatco we strive to bring great new filtration products and technologies to the market that provide the cleanest water filtration possible for the health, safety and happiness of every pool and spa owner - tried, tested and true. With an expert engineering staff in place, and an unparalleled dual indoor - outdoor test facility containing 20-thousand gallons of moving water, Pleatco is able to deeply examine and validate theories, materials and designs while conducting tests on competitive products in order to provide the very best filtration products on the market - At Pleatco we re bringing healthy change to the marketplace. Pleatco Applied is our new specialized innovations division specifically aimed at developing next generation advanced products in partnership with the industry s leading OEM s.
Pleatco Applied is a speciality services of the company that works closely with OEM s and like minded industry partners to develop scientifically engineered innovations for pool & spa. The division is driven through the engineering, sales & marketing arms of the company and harness the full capabilities of the company to deliver a holistic approach to product development, manufacturing and deployment. A unique and powerful opportunity that only Pleatco can provide. Fill up or rejuvenate your spa with clean filtered water from the start. Introducing NEW Pleatco PureStart Pre-Filters - A revolutionary product range scientifically engineered to overcome the problems associated with Tap, Ground and Well water being used for filling and topping off spas and pools regardless of make, model or size. These new disposable sediment filter cartridges are made from unique melt-spun filtration technology for perfect depth filtration. Pleatco PureStart cartridges attach to a garden hose and capture dirt particles filtering the water BEFORE it enters into your spa. A must have! At Pleatco, our goal is to provide you, with a quality customer support experience whatever the need may be.Whether trying to identify your filter for replacement or you need some help understanding how to remove, clean or replace your cartridge. We are here to find answers and solve problems. If you are a business we are more than happy to help you with your orders and deliveries.Our Free Hotline is open during business hours 9am - 5pm (EST) and we respond to web inquiries within a day. Customer Care +1-516-609-0200 (International phone charges apply if calling from outside of the USA) Please note that Pleatco does not sell direct to the public, however we are more than happy to point you in the right direction towards a Pleatco partner store near you or online. Our new Pleatco ADVANCED+PLUS Antimicrobial SPA Filter Cartridges are designed to provide an unsurpassed level of leisure water cleansing. Our new ‘blue-ribbon’ cartridges are built with Pleatco Advanced Point Bonded Filtration Fabric enhanced with an exclusive antimicrobial agent infused into the filtration fabric itself. This technology inhibits the growth of dangerous microbes and provides continuous, durable and effective added protection for the lifetime of the product ensuring the health, safety and well being of your family. Hot tubs provide an excellent way to unwind and relax with family and friends in the privacy of your home or backyard. Taking care of a hot tub should be as easy as soaking in it. Browse our collection of articles and videos that will teach you everything you need to know about hot tub care. Some great articles include: Click on the SWIM UNIVERSITY LOGO to access.